Today is my 1 year Blogaversary! Happy Birthday to TheSweetArt! Looking back on my first post, it's obvious how terrible the picture is (photographing food at night?! with a flash?!) and how nervous I was to put the ingredients together. But since then, I've practiced so much and tried so many new recipes and flavors I never thought I'd like. It's funny how this started out as an opportunity to practice food photography and turned into a major baking adventure. I'm so glad this blog happened to me :) And a HUGE thank you to everyone who reads this/comments/clicks on ads! And now, on to this cake. Put this on your 'must bake' list. It's always time for this cake, I promise. I'd been itching to make this recipe for months now. The original poster kept threatening how amazing this cake was. I'm so glad I finally got around to it! This may be one of my favorite recipes, ever. It's so unbelievably irresistible. I was so excited when I found fresh raspberries in the stores... I have no idea when the season for a lot of fruits are, but they were on sale so I bought them. They went so well with the cake, since it's a bit sweet and raspberries are tart. I want to make this again with an assortment of berries! I didn't have buttermilk but I did have milk and plain yogurt so I mixed half of each together and used that as my buttermilk replacement. It works much better than lemon juice or vinegar in the milk, which takes a while, in my opinion, and is just too runny. I often keep buttermilk at home but in St. Louis, it's a bit of a wasted purchase and would have ended up just going bad. I think it tasted great despite not having actual buttermilk, and I've made it both ways now, and you really can't tell. 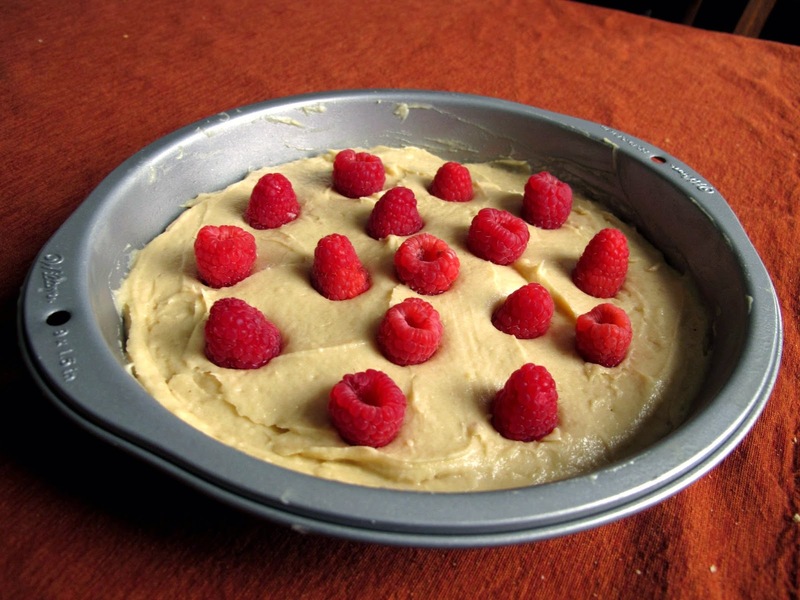 On other occasions, I used whole wheat flour in place of all-purpose, frozen raspberries instead of fresh and my family didn't even notice and loved it! It's a very simple recipe that reminds me why I love baking so much. Beat the butter with 2/3 cup of sugar till fluffy. Add in the egg and the vanilla, beating well. Mix in the dry ingredients with the buttermilk alternately and then pour into the pan. 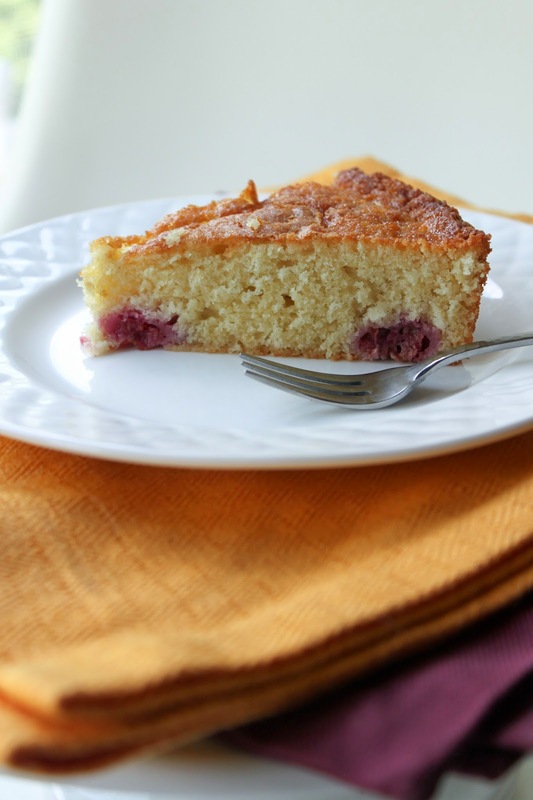 Scatter raspberries over the top and sprinkle the remaining sugar over the top before baking. Bake at 400 degrees F until the cake is golden (about 20 minutes) or a tester comes out clean. 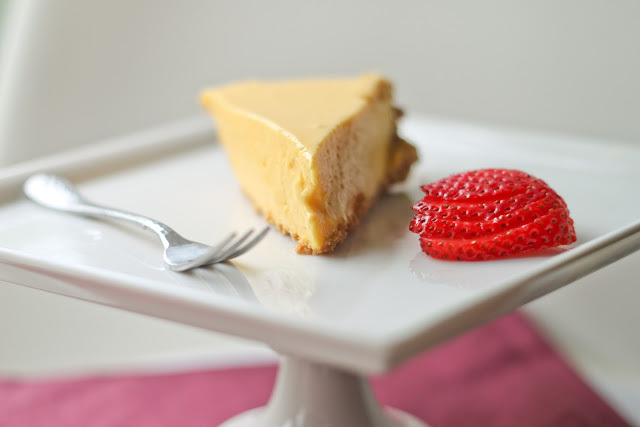 *I mixed 1/4 cup regular milk with 1/4 cup plain yogurt and stirred it till it was combined and used it as buttermilk. You can also try adding any citrus zest to it if you like... about a 1/2 tsp would be good. the cake came out really well.. i made it twice.. its so easy to make..
A few weeks ago I saw a recipe like this one and immediately had to make it. Yours looks amazingly delicious too!